Although the pneumatic tyre had been re-invented by John Dunlop, and the benefits of inflated tyring had been demonstrated over ten years earlier, many car manufacturers and owners still favoured solid rubber tyring as being more dependable and harder wearing. A good example was those fitted to Charles Cordingley’s 6¼hp M.M.C. Phaeton which he used on the 1000-miles trial in 1900. However, as efficient as solid-rubber tyring may have been perceived, upon exiting Reading on the first day of the trial on Monday 23rd April 1900, Cordingley had rear wheel tyre trouble. The car was delicately driven back to Reading, and a telegram sent to London for a new set of wheels and tyres. According to Cordingley, the rubber tyres had only lasted for about 300 miles and, “yet were in rags with pieces two inches in diameter having been stripped off”. As our correspondent’s home town is Reading, he has identified the Paddock Stables at the top of Castle Street, Reading, as being the M.M.C.’s resting place, and while Cordingley himself travelled to Bristol by train, the first night stop, the new wheels arrived at Reading station on the Tuesday morning and were fitted to the car by one of the stable lads, and the car was driven to Bristol later that day by Cordingley’s driver Robert Bunkall. 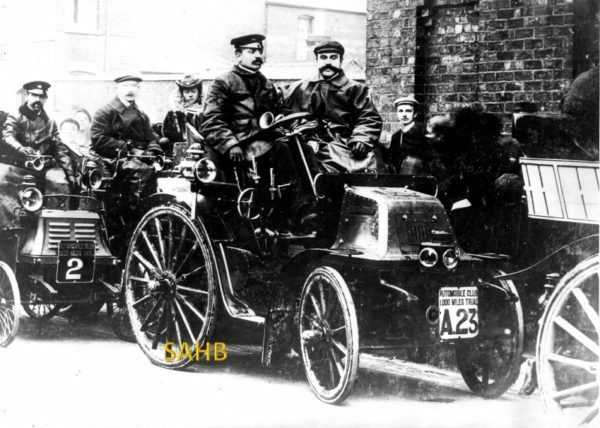 Throughout the trial, several newspapers commented on ‘the remarkable success attending the cars fitted with pneumatic tyres, there being many vehicles so provided, and they are going along splendidly’. It may well be that after his experiences at Reading, Cordingley will have opted for pneumatic tyres. Certainly, as founder and editor of the magazine The Motor-Car Journal, and the organizer of motor-car exhibitions since 1896, he noticeably favoured pneumatic tyring in his editorials from 1900. Note: Charles Cordingley seated in the passenger seat of his M.M.C. Phaeton during the later stages of the event. Just to confirm that my home town used to be Reading, but am pleased to say that it is no longer. Reading was once a lovely market town, but frankly now ruined by a most peculiar inner-ring-road and an unfocused post-war building programme. The centrally positioned oil-powered lamp mounted on the front of this MMC was manufactured by Salsbury & Son of London. These three-front-glass lamps were ‘foot board lamps’, usually fitted to horse-drawn carriages, and fitted behind the horses, so that the carriage driver could see the road that the horses were transversing.